Marvel Studios’ next film, Captain America: Civil War, is getting a lot of press for the pending conflict between Captain America and Iron Man, the introduction of Spider-Man to the Marvel Cinematic Universe and more than enough superheroes to fill out an Avengers movie. That film will also serve as the live-action debut of Chadwick Boseman as Black Panther, one of the very first black superheroes in comics! Stan Lee and Jack Kirby created Black Panther in 1966 during their epic run on Fantastic Four. Black Panther a.k.a. T’Challa was like no other superhero before him. He was the king of a technologically-advanced African nation known as Wakanda. And Black Panther was nobody’s sidekick. One of the reasons that Marvel Studios retains the rights to Black Panther is that he became a solo hero outside of the Fantastic Four franchise, and he was also a member of the Avengers in the early years of that comic. Writer Don McGregor was the first to chronicle Black Panther’s solo adventures, and his innovative run was followed by Jack Kirby, Peter B. Gillis, Christopher Priest, Reginald Hudlin, Jonathan Maberry, and David Liss along with many different comic artists. Marvel has also signaled that a new Black Panther ongoing comic book series will be released next fall following the conclusion of the Secret Wars crossover event. While Black Panther hasn’t made many appearances outside of Marvel’s comic book universe, Marvel Studios clearly thinks that Black Panther could be one of its next film franchises. In 2018, Boseman will star in the Black Panther movie, and it’s a pretty safe bet that he will also show up in the two-part Avengers: Infinity War. Along the way, you can expect to see a whole lot of Black Panther merchandise and collectibles as Marvel paves the way for its next superstar. 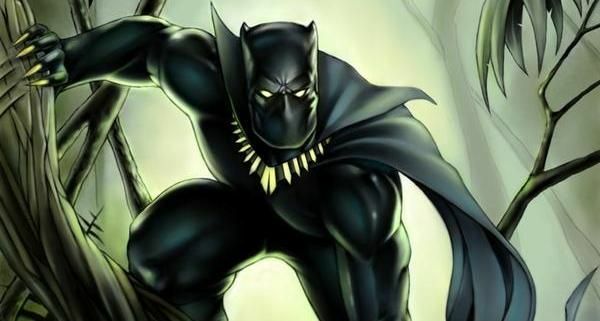 Before Captain America: Civil War hits theaters on May 6, 2016, SuperHeroHype’s Orgins and Evolutions is taking a look back at Black Panther’s long history in comics and a glimpse at his upcoming cinematic adventures. On a desktop, hit Full Screen to read each entry!